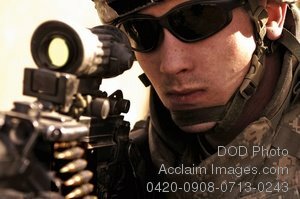 Description: Free, public domain image: Young Army Soldier Looking Through His Rifle Scope. U.S. Army Pfc. Richard Welch, of the 101st Airborne Division, 3rd Brigade Combat Team, 1st Battalion, 187th Infantry Regiment, looks through the scope of his M-249 rifle as he secures his sector during a patrol through Al Betra, Iraq, Nov. 26, 2007. (U.S. Air Force photo by Tech. Sgt. Adrian Cadiz).